We are kickin’ those winter blues with this healthy, tropical treat! Most people I speak to here in the Midwest have had quite enough of the cold and snowy winter. Just when we thought we were done with polar vortexes for the season, another one is on the horizon. Speaking of, who knew that word even existed and now it has become commonplace in our conversations. 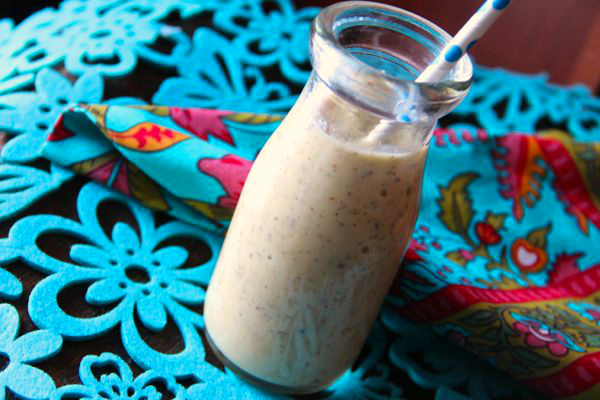 In an attempt to defeat the winter blues, this smoothie was created. 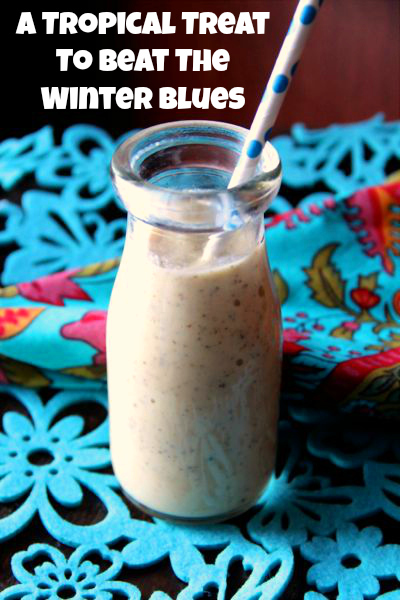 Like most smoothies, this one can be modified easily. I adore ginger so I add close to 2 Tablespoons. If you do not have frozen fruit chunks on hand – use fresh and simply add ice as needed for the blended frozen texture. Or if you use all frozen, simply add the amount of liquid added. Yogurt is added for creaminess but I have had these without yogurt. If you do not have chia seeds on hand then use flax. Prefer a sweet to tart flavor, simply add a tablespoon of honey. Want some additional nutrition boost – add a cup of spinach or kale leaves! Need some protein – add a scoop of protein powder. Yep, the possibilities really are endless. Mangoes are a super fruit high in fiber, Vitamin C, Vitamin B6, Vitamin E, Potassium, Copper, Vitamin A and disease fighting antioxidant compounds. Ginger is a good source of vitamin C, copper, manganese, and potassium. It’s phytochemical and antioxidant content is where it really stands out. Gingerols are antioxidant compounds in ginger that also have great anti-inflammatory properties. Chia seeds contain calcium, omega-3s, antioxidants, fiber and other minerals. Place all the ingredients in the blender and blend until creamy. Serve immediately and be momentarily transported to the tropics, at least until you look back out your window and sigh at the white covered ground.